This individual Report Solving the Micropayment Problem: Online and at the POS is available for purchase. This Report is available to members of Mercator Advisory Group’s Emerging Technologies Advisory Service. Please be advised that this Report is normally part of a research and advisory service that provides ongoing support throughout the year. As such, this Report contains significant depth of content that is selected for its strategic importance to our members. (For a description of these services, see our Advisory Services section). Mercator Advisory Group is pleased to announce that its review of its latest report, Solving the Micropayment Problem, Online and at the Point of Sale. The report reviews both the history and challenges of electronic micropayments and examines how the existing rails have evolved to address under $5 electronic payments at both the point of sale and for online transactions. In particular, the report examines the evolution of multiple micropayment models and how they have shifted the economics of micropayments, especially online. The ad-supported revenue model, powered by Google AdWords and other sponsored advertising sources, has significantly altered the need for a ubiquitous online "coin purse" for digital products below $0.75 in value. At the point of sale, micropayments have been successfully addressed by lower interchange rates for selected merchant categories and, in some markets, by contactless payments. The Solving the Micropayment Problem report includes a review of market participants including PayPal, BSG Clearing Solutions, ClickandBuy, PaymentOne, and Peppercoin/Chockstone. Online micropayments has been an unkind market segment for payment processors aggregating multiple small transactions as a pureplay processing service. The early Internet dream of nearly frictionless purchases of sub $0.75 content has been made irrelevant by free content and the ad-supported revenue growth that powers the best free content sites as well as the growth of search giant Google. Online, it is per transaction charges, not interchange, that eats up excessive margin for sub $1.50 digital content. Given lower interchange rates for low-risk, high volume merchant categories such as QSRs, transit, parking and others where micropayments are common, barriers have dropped for the electronification of under $5 payments. The markets for micropayments at the POS overlap with those for contactless payments. 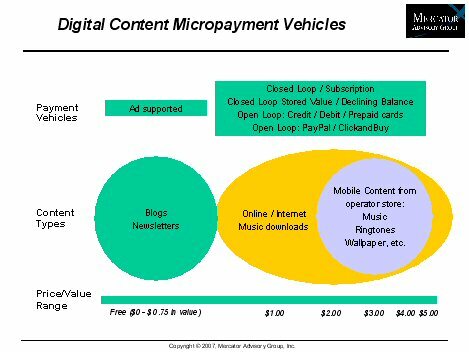 "Under $5 micropayments online have been a persistent source of pain for content creators and distributors," comments George Peabody, Director of Mercator Advisory Group's Emerging Technologies Advisory Service. "Evolution of payment models such as ad-supported content creation and distribution have largely erased that pain. Coupled with subscriptions and payment aggregation, the online picture is clearer but still requires better solutions. Ironically, electronic micropayments work better at the POS than they do online." One of the seven Exhibits included in this report. This report is 23 pages long and contains 7 exhibits, 5 tables and a Glossary of Terms.